Beberapa tahun yang lalu, sekitar tahun 2010, ketika saya sedang di dalam gelombang “gila mengait”, setiap hari, setiap waktu saya akan meng”google” pelbagai pattern baju baby yang comel sehinggalah saya terjumpa satu pattern yang sangat comel. Namanya Clara. Tapi sayang, saya tidak dapat membeli pattern ini kerana pattern ini hanya dijual di dalam bentuk “Kit” sahaja pada masa itu. Few years ago, within the year of 2010, I was in the “crictical state” of having “knitting addiction”, whereby, almost everyday I’ll be -googling- patterns for babies like crazy :O. In search for the cutest pattern meanwhile, I found Clara Dress. Oh yes, it is the ultimate cutest dress i have ever seen. But well, unfortunately, I was not able to purchase this pattern as the dress pattern is sold only as a Kit. Though I was feeling disappointed, I just let it go. Alhamdulillah, saya berkesempatan untuk menulis pattern ini dan berharap anda akan mencuba dan “enjoy” mengaitnya. 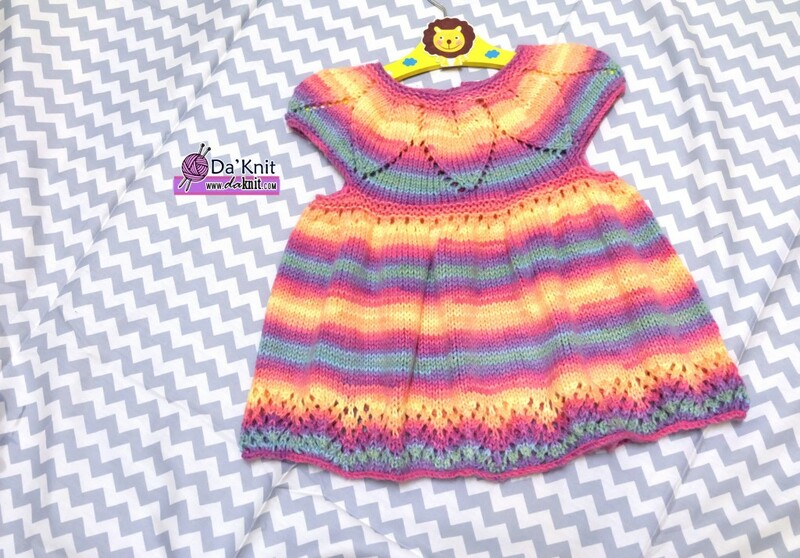 Dress yang comel ini sesuai untuk dijadi sebagai hadiah ataupun dikait untuk anak anda yang comel. Saiznya juga boleh diubah suai mengikut jenis benang kait dan jarum yang digunakan. Jom! Alhamdulillah, I have the opportunity to write down this pattern for free tonight. So, I hope you will enjoy knitting one. 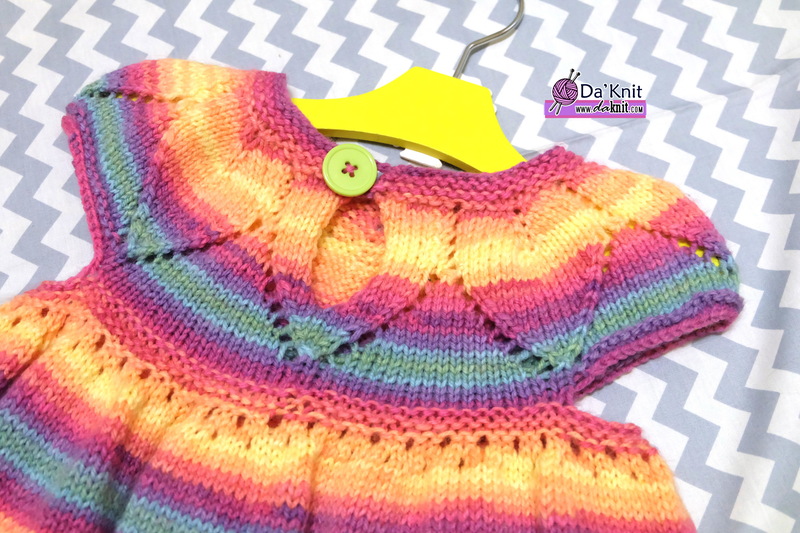 This cute dress can be a gift to your beloved friends who just got her baby or even you can knit one for your own lovely daughter. The size is adjustable according to yarns types and the needles used. 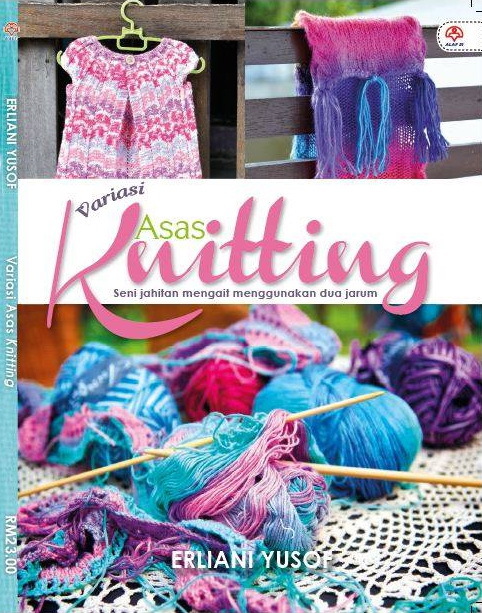 Let’s knit! Knitted in a multiple of 10 sts, + 1 and 4-row repeat. Row 2 : K1, * (yo, ssk) twice, k1, (k2tog, yo) twice, k1; rep from * to end. Row 4: K2, * yo, ssk, yo, sl2tog-k1-p2sso, yo, k2tog, yo, k3; rep from * to last 9 sts, yo, ssk, yo, sl2tog-k1-p2sso, yo, k2tog, yo, k2. 1. Different weight of yarns will produce different size. My pattern using the recommended yarn will produce 6 months to 18 months old size. i notice that, if you continue to increase at least 2 more times before decrease (leaf), you can get 2 years old size. However, for the ARROWHEAD LACE Pattern, you have to recalculate that to match with the number of stitches. 2. If you want to make a smaller size without changing anything in this pattern, I recommend to use 5-ply/sport weight or change your needle to 3.50 mm or 3mm size then you will get 0 – 6 months old size. 3. Remember to check your gauge as everyone’s tend to knit with different tension. 4. Cast On Row 24 and Row 36 by using Thumb Cast On method. 5. Move your marker along while knitting. PLEASE PLEASE PLEASE that if you need to track your count, use marker between each repeats of the leaf stitch pattern. It will helps! ROW 7: 7 + 1 st inc + [ (3+1 st inc +1+1 st inc +3+1 st inc) x 7 times (6 times + the first step of *…*) ] + 7 = 85 stitches as total. Using 4.00 mm, Cast on 63 sts using long tail cast on method. Row 7: K7, yo, *k3, m1, k1, m1, k3, yo* repeat * for 6 more times, K7. Row 8: Purl till end. Row 9: K5, Sl 1, K, Psso, K1, Yo, *k4, m1, k1tbl, m1, k2, Sl1, K, Psso, K1, YO* repeat * for 6 more times, k7. Row 10: P till end. Row 11: K5, Sl 1, K, Psso, K1, Yo, *k5, m1, k1tbl, m1, k3, Sl1, K, Psso, K1, YO* repeat * for 6 more times, k7. Row 12: P till end. Row 13: K5, Sl 1, K, Psso, K1, Yo, *k6, m1, k1tbl, m1, k4, Sl1, K, Psso, K1, YO* repeat * for 6 more times, k7. Row 14: P till end. Row 15: K5, Sl 1, K, Psso, K1, Yo, *k7, m1, k1tbl, m1, k5, Sl1, K, Psso, K1, YO* repeat * for 6 more times, k7. Row 16: P till end. Row 17: K6, yo, sl 1, k2tog, psso, yo,* k15, yo, sl 1, k2tog, psso, yo,*, rpt * for 6 more times, k6. Row 18: P till end. Row19: k6, yo, k3, yo, *ssk, k11, k2tog, yo, k3, yo* rpt * or 6 more times, k6. Row 20: P till end. Row 22: P till end. Row 24: DO NOT TURN, JOIN to knit in the round. CAST on 1 st, K4, PM, K till marker. Row 25: Yo, k9, yo, *ssk, k5, k2tog, yo, k9, yo*, rpt * for 6 more times, ssk, k5, k2tog. Row 26: K till end. Row 27: Yo, k11, yo, *ssk, k3, k2tog, yo, k11, yo*, rpt * for 6 more times, ssk, k3, k2tog. Row 28: K till end. Row 29: Yo, k13, yo, *ssk, k1, k2tog, yo, k13, yo*, rpt * for 6 more times, ssk, k1, k2tog. Row 30: K till end. Row 31: yo, *k15, yo, sl 1, k2tog, psso, yo* rpt * for 6 more times, Sl 1, K2tog, psso. Row 32 : K till end. Row 33: K18, P35, K37, P35, K19. Row 34: K till end. Row 35: K18, BO35, K36, BO35, K18. (74 sts). Row 36: K18, CO 10, K37, CO10, K19. Row 37: K till end. (94 sts). Row 44: *YO, K2* repeat til end. Row 46: K2, YO, “K3, YO* rpt * til end, K1. Row 48: K and increase 12 sts evenly across. Next row: k till end. Do ARROWHEAD LACE (4 rows) at least 6 times repeat. After done, BO in knit stitch. DO BLOCKING for best result. Attach button and crochet a loop as seen in photo below. Jazakillah Ery….Clara dress pun tidak pernah buat….tp Ery punya olahan ini insha Allah nak cuba buat. Maaf atas kelewatan membalas email. Baru cek komen2 di blog ini. I love this baby jewel dress but am having trouble getting the pattern to work out in the yoke section. It has been a while since I have made a pattern like this and don’t know if it is just my lacking concentration that is leading to errors or if there is a problem in the pattern itself. I thought I would check with you to see if you have heard of any errors from others before I try it once again. It seems like it should be very clear and easy but somehow I am not mastering it. Thanks for whatever feedback or support you can give me! Beautiful thank you for the pattern I can’t wait to start knitting this. Thank you for your lovely comment. Happy knitting. I loved the pattern and planning on knitting it soon. Can you please let me know whether I need to use circular needles? Thanks! Yes, you need to use circular needles to knit in the round for the skirt. Hope this will help! Hi Thanks for sharing your pattern. I am having an issue on row 29 of the bodice. Can you tell me what the proper pattern is? row 29 instructions do not follow the pattern. For example, in row 29 instructions the pattern changes and the ssk to shape the leaf isn’t in the right place. yarn overs aren;t in correct position either. Need some help! thanks. Hope you manage to fix the problem now. I replied your mesaj tru Ravelry. Hope it went well! I had real trouble with the bodice as well. I even unpicked the whole of the first 30 rows because I ended up with far too many stitches. I started again, working really slowly and carefully and still had too many stitches. So I adapted and adjusted as I went from row 19. I’m now at row 32 with the correct number of stitches. I think the bodice may end up being a bit ‘full’ looking, but at this point I dont care I’m not going back and doing it again! Hi, I’m having trouble with row 17. I got to the same row before when I started the project. I thought I made a mistake and frogged it, but the same thing has happened. I have followed the pattern to a T, and am left with 19 stitches. Not enough to repeat the * sequence and not enough to end it (6 stitches). Hi, I’m having trouble with row 17. I have followed the pattern perfectly (I frogged it and did it again to double check) but there aren’t enough stitches left to repeat * and too many to end it with 6 knot stitches. Can you help me out? So far, I have no received any error complain on row 17. Did you knit it properly from Row 1? Did you perhaps skip the Slip stitch Psso? If you need further helps, please find me at Ravelry by the name of Snowhitery. Hello, I was wondering, where do i use circular needles and where do i use normal knitting needles? Circular needles can also be used to flat knitting. In this pattern i am using circular tu knit front an back and also knit in the round. Do you know that circular needles can also be used for flat knitting? Thank you for the beautiful pattern. Hi, I am having problems with row 7, even after your extra explanation. I did the maths and the repeated steps within the *..* equals 10 stitches times by 7 is 70 stitches. Add to that the first 8 (K7 plus yo) and the last 7 that makes a total of 85 stitches. This is why I am struggling as you say there should be 84. Am I a lot worse at math than I thought? Please help! Can you please specify how wet should M1? There are different types and i just want to do it correctly. Thank you! It doesn’t matter as the slant is not critical. This is beautiful, it’s really too bad you’re so cocky at the complaint of not having row numbers. So people are starting out and have their focus on not make mistakes, not your mathematical equation. Thank you for your “kind language”. Instead of that, i will be more happy to see someone appreciate my FREE WORK by saying THANK YOU! Besides, the mathematical equation is a bonus lesson, for a newbie to learn something new about reading pattern and how to understand the number of stitches on every rows. You won’t find such a FREE LESSON from a popular designer, you know ;). Take it in a positive way. Not condemning. You say that it is not critical how the M1 is worked but I would like to know how you worked them, and did you work both of them the same? I looked at the photo to try to determine how they had been worked but could not see enough detail. I have already tried doing the lifted stitch from the row below and that does not look good. The next thing I thought to try was just working them as yarn overs but I know that is not how you worked them or (I presume) you would have written the pattern as YO and not as M1. I look forward to your reply and appreciate the info. Hi yes. its not critical. When I do M1, I usually go for M1R. Hope this helps! And yes.. I do M1R to all rows that applied.